"This is my Doxie-Chon, Murray at about 4 years old. Murray weighs about 11 pounds, periodically needs grooming, and can do many tricks—including balancing on a ball like a circus dog. He is a really wonderful dog, and people often say he is so cute that he looks like a stuffed animal. He has a cheerful personality and loves, loves, loves walks on the beach." The Doxie-Chon is not a purebred dog. 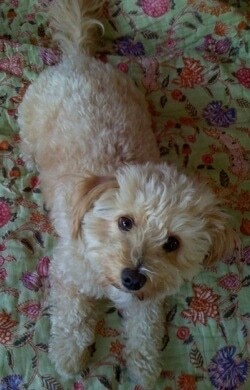 It is a cross between the Bichon Frise and the Dachshund. The best way to determine the temperament of a mixed breed is to look up all breeds in the cross and know you can get any combination of any of the characteristics found in either breed. Not all of these designer hybrid dogs being bred are 50% purebred to 50% purebred. It is very common for breeders to breed multi-generation crosses. "These are my four-month-old Doxie-Chons. Mother is a Bichon Frise and father is a longhaired mini Dachshund. They are very friendly, loving and good with my children. My kids think they look like stuffed animals, they are so cute."